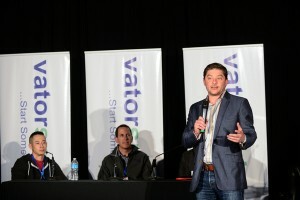 As part of its sponsorship of Vator’s tech conference and startup competition in Oakland, our own Power of Persuasion expert, Andrew Hurteau, provided presentation skills coaching to the finalists of the start-up competition. Many presenters took advantage of this opportunity, including OppSites, the winner of Vator Splash Oakland and Rockbot, a winner of Vator’s Oakland-focused Oaktown competition. Start with a strong hook. Your audience wants to know “What’s in it for me?” Answer them. Brennen Byrne from CLEF (which finished in the top five startups) began his presentation with a question: “How many passwords do you have to remember every day?” I think every single person in the audience groaned. He hooked them. He got their attention by connecting them personally to the problem his company can solve. Sometimes your product has so many benefits and features, you want to list them all. Don’t. Prioritize your list. And when you do so, three is the magic number. Reduce 10 benefits to three categories of benefits. Reduce six features to the three best. Your audience will struggle to remember ten benefits, but they’ll be able to talk about three exciting ones days later. Let us catch you grinning. You love what you do, right? Enthusiasm is infectious. Allow us to see your excitement for your work and we will get excited too.